We've written a full open source graphics library that can draw pixels, lines, rectangles, circles, text and bitmaps as well as example code and a wiring tutorial . The code is written for Arduino. Note: If you want to show the whole pitcure on the screen, it's suggest using arduino mega2560. Because when you use Arduino UNO, the memory is not enough which cause the application simply ran out of memory. If you want to show Chinese and English characters, the memory of ordinary Arduino UNO board is enough. The breakout has the TFT display soldered on (it uses a delicate flex-circuit connector) as well as a ultra-low-dropout 3.3V regulator and a 3/5V level shifter so that you can use it with 3.3V or 5V power and TTL control logic. Suggest using arduino / 51 / 5V single chip microcomputer because this module is equipped with power and I/O voltage transfer circuit. Compatible with arduino port. Plug in then you can run it. Compatible with 5110 LCD Interface. 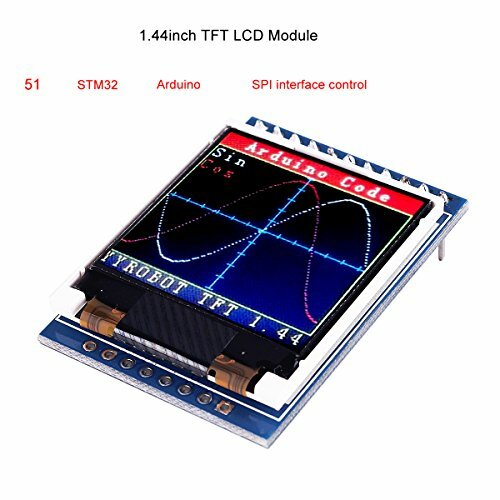 Support arduino / 51 / SMT32 etc general single chip microcomputer. The breakout has the TFT display soldered on (it uses a delicate flex-circuit connector) as well as a ultra-low-dropout 3.3V regulator and a 3/5V level shifter so that you can use it with 3.3V or 5V power and TTL control logic. Suggest using arduino / 51 / 5V single chip microcomputer because this module is equipped with power and I/O voltage transfer circuit. Compatible with arduino port. Plug in then you can run it; Compatible with 5110 LCD Interface. We Have a Strong After-sales Service Team: As long as you have any questions about the product, we will resolve your issue immediately if received your email, your satisfactory purchase experience is our greatest hope! How to email us? Plz click "MakerFocus" and click "Ask a question" to email us! Looking for your consultation!